Clinical trials suggest that increased risk of osteoporosis and fracture are the only serious side effects of adjuvant aromatase inhibitors (AIs), but little is known regarding toxicities of AIs in non-trial populations. We evaluated whether use of AIs was associated with myocardial infarction, stroke, and fracture in a community-based population. Using data from the HealthCore Integrated Research Database, 44,463 women aged ≥50 years with ≥2 breast cancer diagnosis codes between 2001 and 2007 were followed through 2008. Of these, 44,026 were matched using propensity score methods to women aged ≥50 years with no breast cancer codes. We assessed whether treatment with AIs was associated with myocardial infarction, stroke, and fracture using Cox proportional hazards models with time-varying treatment variables. 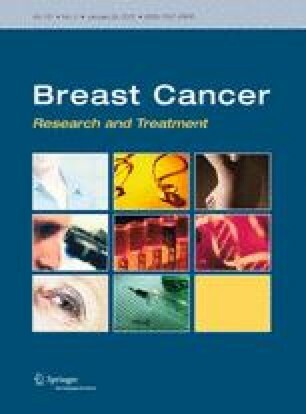 Among breast cancer patients, 68.7% received no hormonal therapy, 20.6% received AIs (15.8% received only AIs, 4.8% were also treated with tamoxifen), and 10.7% received tamoxifen only. Breast cancer patients on AIs had a higher risk of any fracture (AHR = 1.13, 95% CI = 1.02–1.25) than breast cancer patients not receiving hormonal therapy. Patients on tamoxifen had a lower risk of hip fracture (AHR = 0.51, 95% CI = 0.32–0.81) than breast cancer patients not receiving hormonal therapy. Rates of myocardial infarction and stroke for patients on AIs or tamoxifen did not differ significantly from breast cancer patients not on therapy. The side effect profile of AIs in this community-based population was similar to that seen in clinical trials. These findings provide reassurance that AIs appear to be associated with few serious side effects. This study was funded by the National Institutes of Health (R01 CA127652 to Dr. Keating). Dr. Eric Winer received an honorarium from Novartis for consulting work. The other authors have no disclosures.